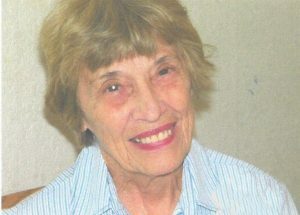 Charlene Wytovak, 85, of Texas City passed away on Tuesday, February 5, 2019. She was born December 3, 1933 in Houston, Texas to Charles and Josephine Schultz. Charlene lived in Texas City for 60 years, she was a member of Queen of Peace Catholic Church, a Carmelite with Queen of Peace, and she worked at College of the Mainland, Mainland Center Hospital and was a former Substitute Teacher with La Marque ISD. She was all about being with her family. She is preceded in death by her parents. Charlene is survived by her husband of 70 years, Joe R. Wytovak, son Joey Wytovak and wife Shirley, grandchildren: Jeremy Wytovak and wife Vicki, Stephanie Angon, Del Wytovak, Bethany Smith, JC Bertram and Jennifer Hartsfield, her sister Beverly Self, her niece Roxy Landry and nephews Danny Self and Doug Self. A visitation will be on Tuesday, February 12, 2019 from 6:00pm – 8:00pm with a Vigil at 7:00pm at the Crowder Funeral Home in La Marque. A graveside service will be at 10:00 am on Wednesday, February 13, 2019 at Mt. Olivet Catholic Cemetery with Father Chacko Puthumayil officiating. Pallbearers will be Timmy Alcala, Ty Alcala, Brett McLawchlin, Cole McLawchlin, James Stidham, Jon Landry, Tommy Mansfield, Dudley Carroll, Mike Stidham and Dickey Pearson. Honorary Pallbearers will be Travis Stark, Anthony Stark, Trevor Trexler and Tyler Trexler. The family would like to especially thank the Ashton Parke Care Center for the care given to Charlene. Please accept my condolence. Psalms 46:1 says; “God is our refuge and strength, a help that is readily found in times of distress” May these words comfort your heart as you remember all your precious times spent with Charlene. My deepest sympathy.